Sometimes the best opportunities come during the worst of times. Professionals, especially those in the medical field, are taking advantage of real estate market conditions with the intentions of reaping future benefits. 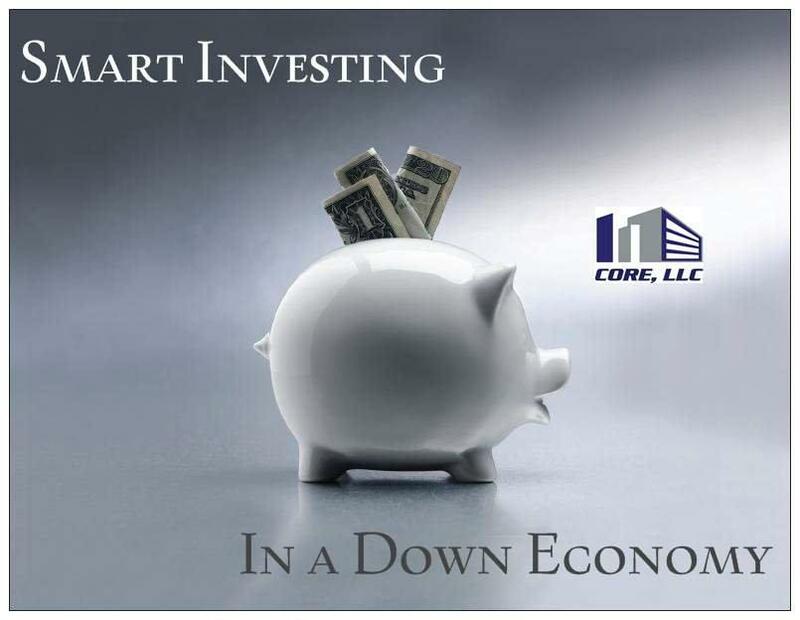 According to Allen Dreher, Director of CORE, LLC, it takes knowledge, understanding of the market and the skill to take full advantage of these opportunities. When one firm walked into their landlord’s office to negotiate a new lease and subsequently discovered that a renewal would result in a significant price increase, they switched into purchase mode. “That was the only push we needed,” said Jim Miles, attorney at Miles & Peters, as he explained that for years he had observed how his clients’ profit more from real estate than any other investment. The timing was January of 2009, the beginning of the ‘Great Recession’, where potential buyers had opportunity to rise to the occasion of falling of interest rates. Instead of signing a new lease, the firm followed the signs of the time and set out to stake their claim in the real estate world. Fred Simmons, currently Chief Executive Officer of Clearwater Cardiovascular and Interventional Consultants, experienced a similar buying opportunity when he served as an Executive Director at a previous practice. After the real estate downturn of the late 80s, his then practice was able to secure and buy a piece of distressed property next to their parent hospital. Though buying in a weak market was his first experience, Simmons knows what a good investment looks like; and it comes in various sizes, spaces and floors. He continues to buy throughout changing real estate trends and continues to share his knowledge with others in his profession. Although buying may seem tempting, making the transition from renter to owner is a daunting task for some physicians. The Pinnacle Group, recognized mostly for its role in healthcare consulting, has recently expanded its frontier with CORE, LLC to fit the needs of physicians and other professionals looking to capitalize on owning their office space rather than rent long-term. David White, Executive Director of Pinnacle Healthcare Consulting explained, “In an industry where so many physicians are making less money, it can be reassuring to know property ownership in a practice is a stable investment with more operational control. However, sometimes it is hard to know where to begin and how to find the right space answers to keep things moving forward and manage the budget,” said White. While good timing can be the extra push for prospective buyers, one factor that can be overlooked-time investment. Miles said that he and his partner spent on average five to ten hours per week on research, design and build-out of their property. Sometimes even the best laid plans can get complicated and many little items can become large without the proper remedy. Time can literally mean money when one is simultaneously managing a business and buy/building out property. Simmons suggested that unless there is someone in the practice who is familiar with the processes, seeking professional help may be a beneficial option and that use of a consultant would help with the issues a practice may not fully understand. Dreher is one such individual who enjoys taking the reigns and managing these real estate puzzles. CORE can be viewed as a boutique service where physicians can pick and choose the services they need. He went on to explain that CORE is one of the few services available that coordinates strong, experienced resources to assist clients achieve a successful, efficient outcome. The services assist in mapping out a turnkey solution–from planning, to site selection, licensing issues, financing and build-out. “I think it helps immensely when you have a quarterback that can work with all of the individual players and get them to work together to find solutions when everyday problems arise,” said Dreher. To request information, please contact Allen Dreher of CORE at 303.378.5567 or email to adreher@pinnaclegrouphc.com. 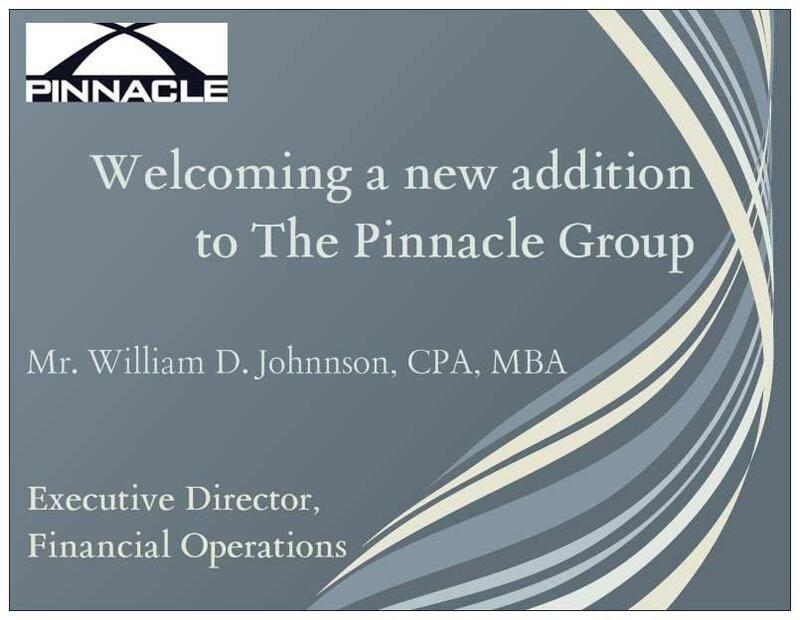 The Pinnacle Group is excited to extend a warm welcome to Mr. William D. Johnson, CPA, MBA, a recent addition to the Pinnacle Team as Executive Director of Financial Operations. Mr. Johnson offers a wide range of healthcare experience to the Pinnacle Group that includes nearly 30 years of executive leadership. His areas of expertise include strategic healthcare initiatives with health systems and physician practices. Bill’s professional experiences include strategic planning, business development, physician recruiting, operational management of large physician practices in multiple locations, outreach development, financial operations, business/practice mergers and acquisitions, physician/hospital joint ventures, selection of practice management and electronic health systems for practices. He has additional experience in third-party contracting, physician integration strategies, physician compensation models and tax planning for strategic decisions. Within Pinnacle, Bill will provide financial and strategic direction as well as consulting on client engagements. Prior to joining Pinnacle, Bill served 14 years as a Vice President of Finance with the HealthONE Hospital System and more recently, 15 years as a Chief Executive Officer for Western Cardiology Associates and Aurora Denver Cardiology Associates PC, (the largest cardiology group practice in the metro Denver market place). Bill was actively involved in providing strategic leadership and organizational direction for a large cardiology group practice encompassing all sub specialties in cardiology and 150 employees offering cardiac care in Colorado, Wyoming and Nebraska. He developed and provided Board direction to three separate business entities encompassing under arrangement cardiac cath laboratories in Aurora, Denver and Durango, Colorado. Bill’s additional experience includes time with Coopers & Lybrand Certified Public Accountants in both their Chicago and Denver offices with a focus on financial auditing and tax planning for individual and corporate clients. In his free time, Bill enjoys the serenity of fly-fishing in Colorado’s rivers and streams. He additionally enjoys other forms of outdoor recreation such as playing tennis and mountain biking. However, don’t peg him as your standard Colorado resident. His interests are as varied as they are unique. Just ask him about his interest in amateur radio. The Pinnacle Group at HCCA Compliance Institute – Dallas 2010! The Pinnacle Group will be attending the Health Care Compliance Association’s 14th annual Compliance Institute in Dallas, Texas – April 18th – 21st. 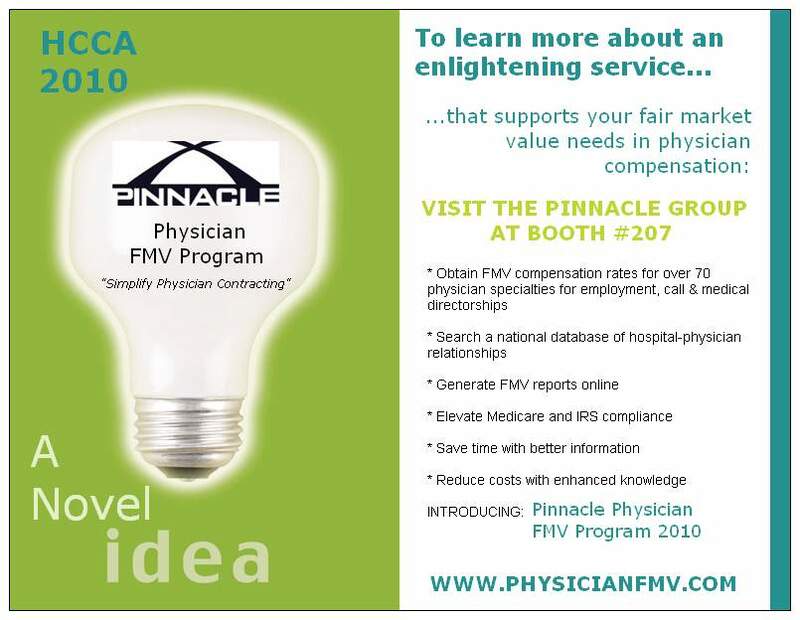 Visit the Pinnacle Group at booth #207 to enter the drawing for a 2010 Pinnacle Physician FMV Program license, valued at $8,750. 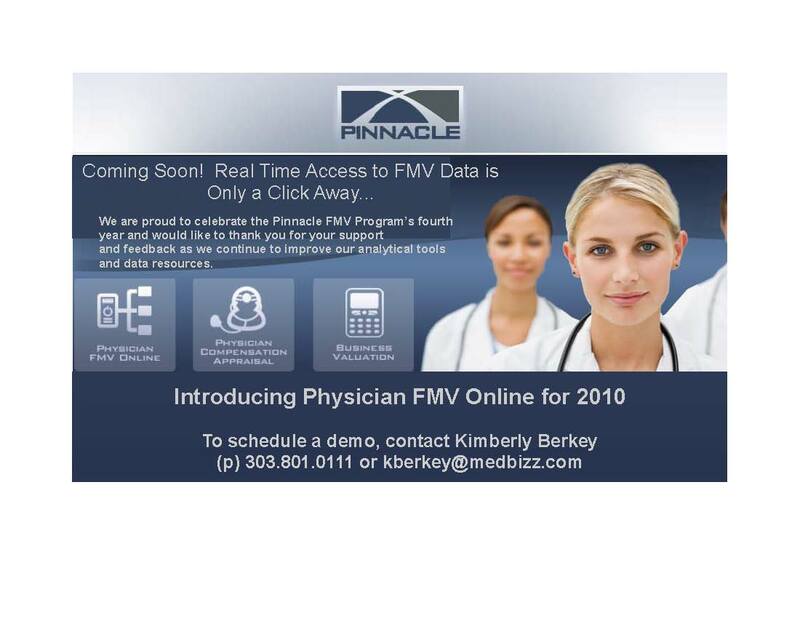 The Pinnacle FMV Program dramatically reduces the complexity of determining physician fair market value. The Program helps you build internal capacity and provides you with more control over the contracting process with powerful information and proprietary tools to help you make defensible decisions about physician relationships. 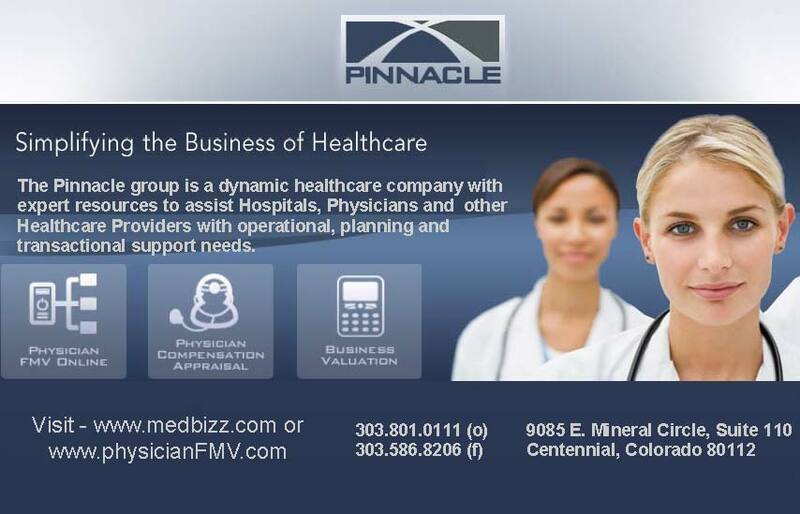 The Pinnacle FMV Program dramatically reduces the complexity of determining physician fair market value. It builds internal capacity and gives you more control over the process by providing proprietary tools and powerful information to help you make defensible decisions about physician relationships. Hospitals using the FMV Program immediately possess greater knowledge on which to base physician contracting decisions, the reliability of a proven FMV analytical methodology and improved capacity to manage and document compensation and other contractual terms. Overview: With increasing pressure for hospitals to align with physicians, understanding your options, what Fair Market Value is and how it effects those options is an integral step to compliance and successful integration. This program will provide practical insights into this complicated but critical topic. The University of Pittsburgh Medical Center says it has created an app doctors can use to receive important patient data via their BlackBerry smartphones. In addition, the health care organization has completed a proof-of-concept of a technology platform that helps doctors and patients share information. Don’t let the current stabilization in the U.S. not-for-profit healthcare sector fool you. 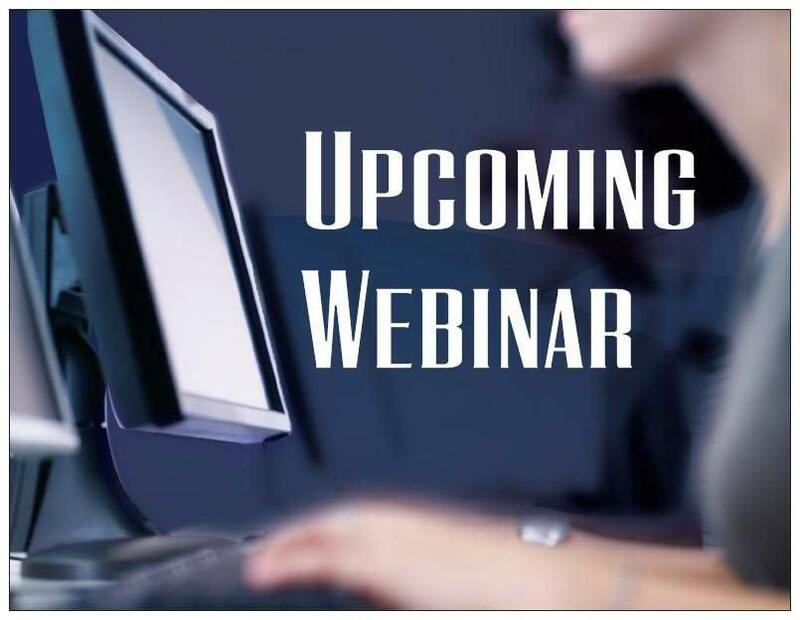 Looming financial and operational stresses may make this only a temporary rebound, according to Martin Arrick, managing director for Standard & Poor’s Ratings Services’ not-for-profit healthcare group, in a teleconference on March 2. If RAC audits have hospitals reaching for aspirin, then the MIP may just land them in intensive care. It may have been flying under the radar for the past four years, but the Medicaid Integrity Program (MIP) is about to become healthcare providers’ latest challenge, with more dollars at stake and more provider types at risk. Health care fraud could be reigned in if more attention was paid to protecting physicians from it rather than investigating them for it. That was the general message the American Medical Association (AMA) relayed to government officials at a “National Summit on Health Care Fraud” on Jan. 28. 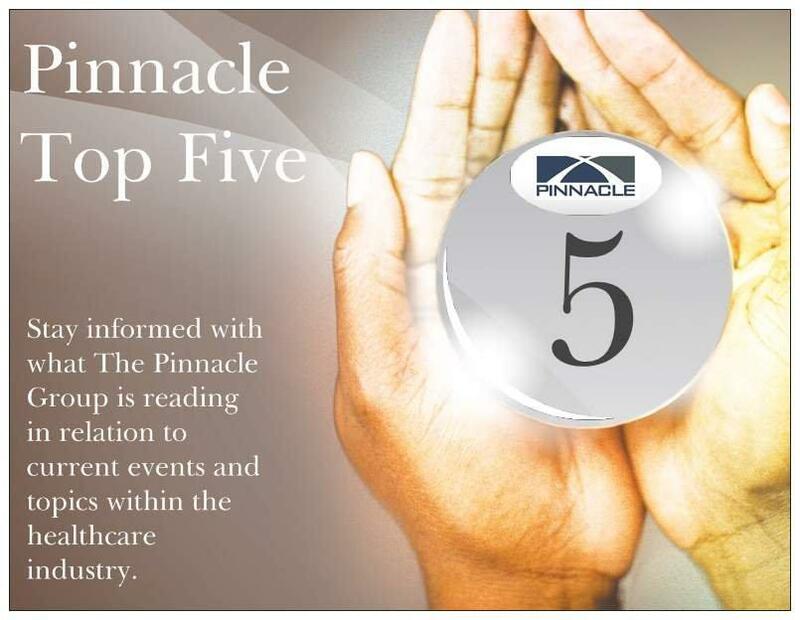 Stay informed with what The Pinnacle Group is reading in relation to current events and topics within the healthcare industry. Dr. Sanjay Gupta explains how your care may change and how much you’ll pay if the current health care bill is approved. The Cleveland Clinic and some of its leading physicians have been criticized for their financial associations with industry and the limited disclosure of these relationships to patients and the public. In response, the medical center has strengthened its policies and oversight with regard to conflicts of interest and required that all industry relationships be submitted for approval. Since December 2008, it has also disclosed on its Web site (www.clevelandclinic.org) some of the industry ties of its 2000 physicians and researchers and their immediate families. In the policy journal Health Affairs, Francois de Brantes, a nationally known advocate of health care quality, and his co-authors propose a new health care reimbursement model that comes with a warranty. Optimally managing costs and clinical quality depends on understanding and managing a hospital’s performance drivers. By creating the right organizational structure and processes for accessing and reporting data, hospital leadership can more effectively manage the organization’s resources and improve performance. CNN’s chief medical correspondent, Dr. Sanjay Gupta, answers viewer questions on the health care reform bill. 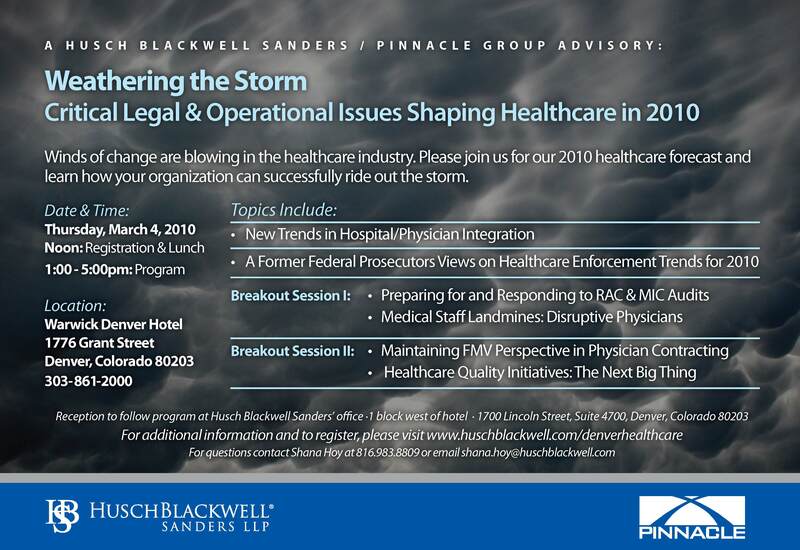 The Pinnacle Group is proud to join together with Husch Blackwell Sanders and invite you to our 2010 healthcare forecast, where you can learn how your organization can successfully ride out the storm. Please register by Thursday, February 25 by visiting the website www.huschblackwell.com/denverhealthcare. Select your breakout sessions and indicate if you will join us for the reception. For questions contact Shana How at 816.983.8809 or email shana.hoy@huschblackwell.com. We are proud to celebrate the Pinnacle Physician FMV Program’s fourth year and would like to thank you for your support and feedback as we continue to improve our analytical tools and data robustness. Over one hundred hospitals nationally have found that the Pinnacle Physician FMV Program empowers them to make smart and supportable decisions with regard to physician compensation fair market value matters. For 2010, we are excited to introduce Physician FMV Online. Our new online application offers the workbooks in a more user-friendly format along with the ability to generate custom opinion letters on the fly, data backed by Pinnacle’s FMV opinion as well as includes detailed data on compensation for employed physicians, medical director hourly rates and daily call payments. This new feature allows you to drill down the data you need, keep track of physician relationships and access the FMV Network data to conduct your own research. The Program generally pays for itself in two uses (i.e., avoiding fees for focused consulting reports). As a benefit of Program participation, hospitals are given access to market comparable data on physician arrangements at other participating hospitals. This information is continually updated. In addition to the efficiency and savings, the Program creates consistency across physician contracts and promotes Medicare/IRS compliance. Use of the Program payment ranges is backed by an objective and proven third-party methodology. The Program increases the organizational capacity and sensitivity for identifying and solving physician compensation challenges. Thank you for taking a moment to read our blog. Coming soon, the Pinnacle Team will be using this blog to provide you with relevant information related to various aspects the healthcare industry. The Pinnacle Group provides a range of strategic, financial and operational services to help hospitals, health systems, physician groups and other healthcare organizations improve their clinical and business performance. Pinnacle Healthcare services seek to simplify success in healthcare. By building relationships and championing innovation, we have created a dynamic set of services backed by a powerful team to help you solve the most complex challenges. With our new blog, we hope to pass on useful information to keep you current on the happenings in healthcare. Thank you for your time and please visit again soon!